One of the libraries to receive a huge amount of focus in 2015 has been ReactJS, a library created by Facebook for building user interfaces and web applications. It’s worth noting that this tutorial assumes some familiarity with React in general, its syntax and concepts. If you’d like a refresher, the ReactJS docs are a good place to start. 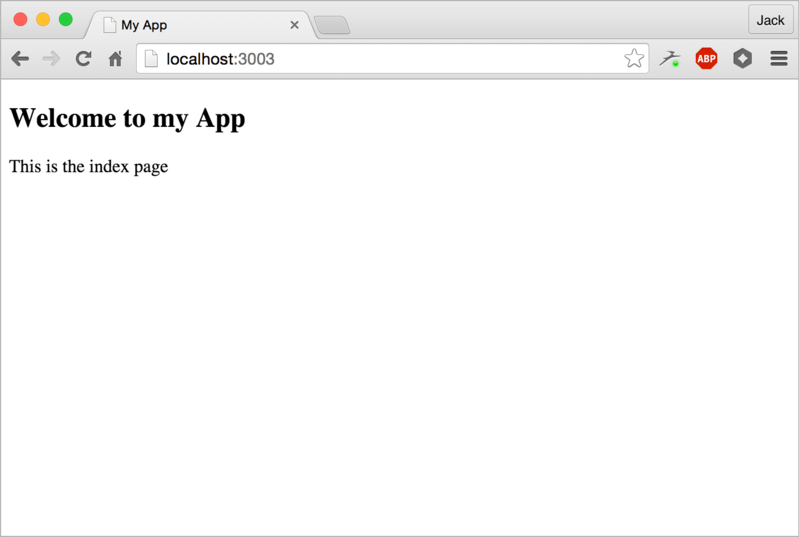 ejs is a templating engine that we’ll use to render our HTML on the server. express is a small web framework we’ll run our server on. react-router is a popular routing solution for React so our app can fully support and respect URLs. 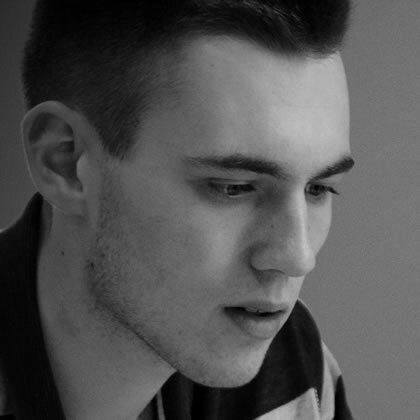 react-dom is a small React library used for rendering React components. We’re also going to write all our code in ECMAScript 6, and therefore need to install BabelJS and configure that too. What we’ve done here is install Babel’s command line interface (CLI) tool and configured it to transform our code from ECMAScript 6 (or ES2015) to ECMAScript 5, which is more widely supported. We’ll need the React transforms when we start writing JSX when working with React. Here we’re using ES6 modules, which I wrote about on 24 ways last year, if you’d like a reminder. We tell the app to render the index view on any GET request (that’s what app.get('*') means, the wildcard matches any route). These are just placed at the top of server.js, after the import statements. Later we’ll move these into a separate file, but for now they are fine where they are. The ReactDOM package provides react-dom/server which includes a renderToString method that takes a React component and produces the HTML string output of the component. It’s this method that we’ll use to render the HTML from the server, generated by React. From the React Router package we use match, a function used to find a matching route for a URL; and RoutingContext, a React component provided by React Router that we’ll need to render. This wraps up our components and provides some functionality that ties React Router together with our app. Generally you don’t need to concern yourself about how this component works, so don’t worry too much. The renderToString method from ReactDOM takes that RoutingContext component we mentioned earlier and renders it with the properties required. Again, you need not concern yourself with what this specific component does or what the props are. Most of this is data that React Router provides for us on top of our components. I know that felt like a lot of work, but the good news is that once you’ve set this up you are free to focus on building your React components, safe in the knowledge that your server-side rendering is working. To check, restart the server and head to http://localhost:3003 once more. You should see it all working! 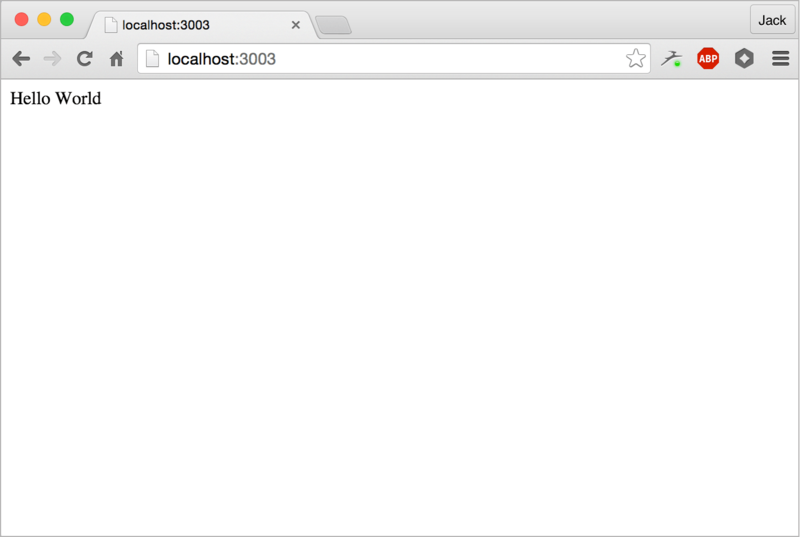 If you now restart the server and head to http://localhost:3003/about` you’ll see the about page! You can now click between the pages to navigate. However, everytime we do so the requests hit the server. Now we’re going to make our final change, such that after the app has been rendered on the server once, it gets rendered and managed in the client, providing that snappy client-side app experience. I’ve also added in a script tag to build.js, which is the file we’ll generate containing all our client-side code. The first thing you might notice is the mention of createBrowserHistory. React Router is built on top of the history module, a module that listens to the browser’s address bar and parses the new location. It has many modes of operation: it can keep track using a hashbang, such as http://localhost/#!/about (this is the default), or you can tell it to use the HTML5 history API by calling createBrowserHistory, which is what we’ve done. This will keep the URLs nice and neat and make sure the client and the server are using the same URL structure. You can read more about React Router and histories in the React Router documentation. Finally we use ReactDOM.render and give it the Router component, telling it about all our routes, and also tell ReactDOM where to render, the #app element. We’re actually almost there! The final thing we need to do is generate our client side bundle. For this we’re going to use webpack, a module bundler that can take our application, follow all the imports and generate one large bundle from them. We’ll install it and babel-loader, a webpack plugin for transforming code through Babel. Note first that this file can’t be written in ES6 as it doesn’t get transformed. The first thing we do is tell webpack the main entry point for our application, which is client-render.js. We use process.cwd() because webpack expects an exact location – if we just gave it the string ‘client-render.js’, webpack wouldn’t be able to find it. Next, we tell webpack where to output our file, and here I’m telling it to place the file in public/build.js. Finally we tell webpack that every time it hits a file that ends in .js, it should use the babel-loader plugin to transform the code first. Now we’re ready to generate the bundle! This will take a fair few seconds to run (on my machine it’s about seven or eight), but once it has it will have created public/build.js, a client-side bundle of our application. If you restart your server once more you’ll see that we can now navigate around our application without hitting the server, because React on the client takes over. Perfect! The first bundle that webpack generates is pretty slow, but if you run webpack -w it will go into watch mode, where it watches files for changes and regenerates the bundle. The key thing is that it only regenerates the small pieces of the bundle it needs, so while the first bundle is very slow, the rest are lightning fast. I recommend leaving webpack constantly running in watch mode when you’re developing. First, if you’d like to look through this code yourself you can find it all on GitHub. Feel free to raise an issue there or tweet me if you have any problems or would like to ask further questions. Next, I want to stress that you shouldn’t use this as an excuse to build all your apps in this way. Some of you might be wondering whether a static site like the one we built today is worth its complexity, and you’d be right. I used it as it’s an easy example to work with but in the future you should carefully consider your reasons for wanting to build a universal React application and make sure it’s a suitable infrastructure for you. With that, all that’s left for me to do is wish you a very merry Christmas and best of luck with your React applications!